Whether you’re a professional chef, a cook, or a home chef who just loves to experiment and hone your meat preparation skills, a boning knife is an essential tool. Indeed, each type of knife has their fundamental functions, but with just a boning knife, you can carve all kinds of meat. Thus, by all means, you need the best boning knife in your kitchen. What Is A Boning Knife? Obviously, not all people are familiar with boning knives. I can still remember the first time I bought a boning knife when I had my own family – back then, I only used whatever knife we had on our countertop to carve our holiday ham. Boning knives are only essential when you prefer buying whole meat chunks and cut it into serving pieces at home. A boning knife usually tapers to a sharp point and has a very narrow blade. It measures 12 to 17 cm in length and is not “thick” as other kitchen knives because their flexible blades are designed for precision boning, especially making deep cuts and holes. While there are flexible boning knives, there are also stiff ones. Stiffer ones are ideal for boning beef and pork whereas, for softer meat forms such as poultry and fish, the flexible type is often preferred. Some flexible boning knives even feature an arched blade for a single-pass cut in removing fish from its bones. Some of the immediate benefits you’ll gain from using a boning knife are as follows: It makes the deboning process faster, it removes bones in a breeze, it leaves the cuts intact with less meat wasted, and most importantly, its sharp and thin blades meant for precision cutting can prevent slippage and injury. It’s a painstaking task to debone large cuts of meat, especially that of pork or beef. Some just rely on a chef’s or butcher’s knife to do the job, but the task will definitely be twice as hard and will take longer if you use either. A good boning knife is a perfect tool to get the job done. Its shape, weight, and thickness are precisely what you need to debone the meat perfectly in no time. Learn how to use this excellent tool for deboning in the short clip below. Choosing a boning knife is a tedious process. You shouldn’t merely buy a best seller or one with an aesthetic that caught your eye. It’s imperative to know exactly what features and specifications to consider if you want to acquire an exceptional boning knife. Below are some criteria to take into account when scouting for the best boning knives in the market. Boning knives have blades of varying thickness and width. The meat type you always work on determines the boning knife type you need. Narrow boning knives are best used for easier cutting around bones and cartilages, such as ribs and chops. On the other hand, wide boning knives are ideal for chicken and pork whereas the curved type is intended for precise cutting close to the bone. As mentioned earlier, stiff knives are preferred by chefs when deboning less tender and thick meats such as beef or pork whereas flexible knives let you cut softer meat forms such as poultry and fish seamlessly, offering great flexibility and control. On the average, a blade size ranging from 5 to 6.5 inches are the most common ones available on the market. It’s worth noting that there’s no such thing as a “one size fits all” when it comes to boning knives – the smaller the blade, the more flexible it is. Hence, choose the appropriate blade size depending on the level of delicateness needed by your meat cuts. A narrow blade for is best suited for lamb and beef while a wider blade is a good option for chicken. A few brands offer blades measuring from 7 to 9 inches, tailored for huge meat cuts. For home chefs, longer blades like these are unnecessary, but for butchers and chefs, it makes their job way easier. The blade design can mean the difference between spending a few minutes deboning and spending half an hour struggling to cut the meat. Some blades are curved, and some are straight. A curved blade lets you remove fish bones in just one quick swipe. A straight blade, on the other hand, is intended for intricate cutting and would prove to be tiresome when deboning fish. Boasting high-carbon stainless steel blades, slip-resistant textured finger points, finger guard, polyprene ergonomic handle, and a razor sharp edge, the ﻿﻿Merce﻿﻿r Millennia Boning Knife is one of the top options you can find out there. We loved the curved edge of this boning knife. It is perfect for trimming sinew and fat, as well as fish, poultry, and even bread. Furthermore, its color-coded handle reduces cross contamination between foods, not to mention how it adds a pop of color to the kitchen. 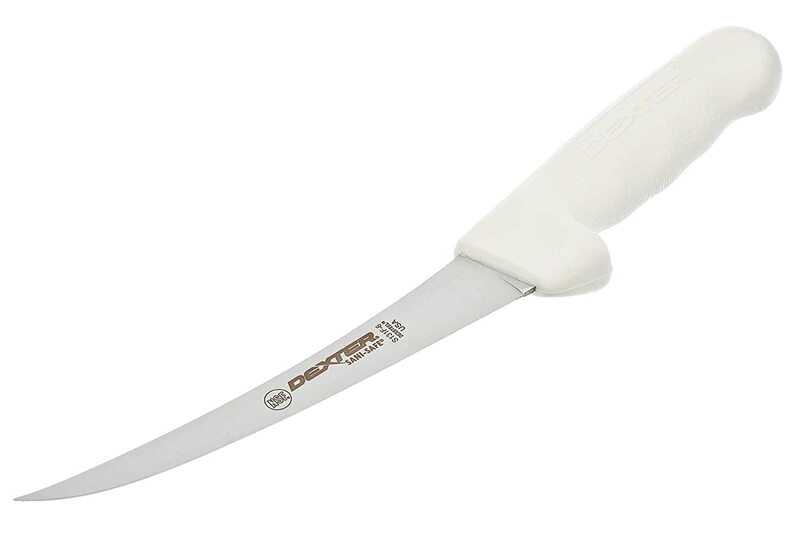 Overall, this knife is sharp, very easy to handle, and ideal for cutting meats. The curvy and flexible blade of the Dexter-Russell Boning Knife lets you work across in detail during the boning process. Made with high carbon steel and a Grip-Tex handle for user safety, this knife is tailored for people who prioritize precision over anything when deboning. 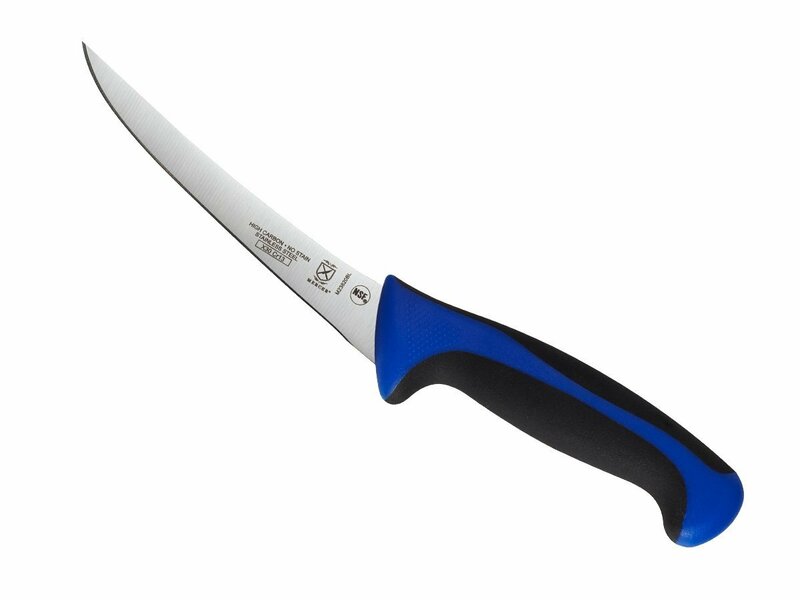 The upward curve and razor-sharp edge make it super easy to slice through fish and poultry. What we liked about this knife’s thin blade is it’s designed to especially focus on design delivering a seamless performance whatever it is you’re cutting. Anyone will admire the special sealing of the Grip-Tex handle around the blade because it doesn’t only seal out any bacteria lingering on the surface, but it also makes the knife easy to clean and maintain. Update International’s Boning Knife ensures the sharpest edge and maximum cutting performance all the time, fitting a variety of cutting needs. It features a skillfully hand-honed curved blade ready to slice through every meat it encounters. We specifically bought and tried this blade because of a load of positive reviews this particular knife garnered. Luckily, this knife didn’t fail us. Here's what to expect from this knife: every single food item you’ll cut using this blade feels like cutting through warm butter. Moreover, the handle is meaty, giving you a nice feel for a solid grip. The blade is precise and smooth, allowing you to cut things with incredible ease. 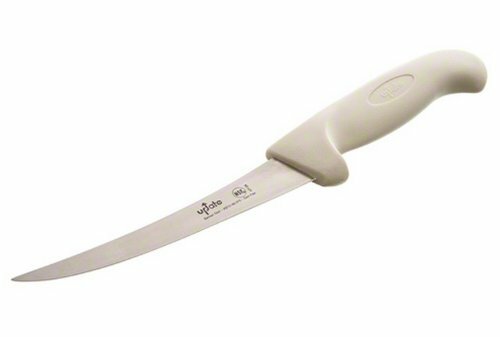 The greatest thing about this blade is it’s neither too stiff nor flexible – it’s somewhere in the middle, making it an excellent tool for deboning hard and tender meat types. 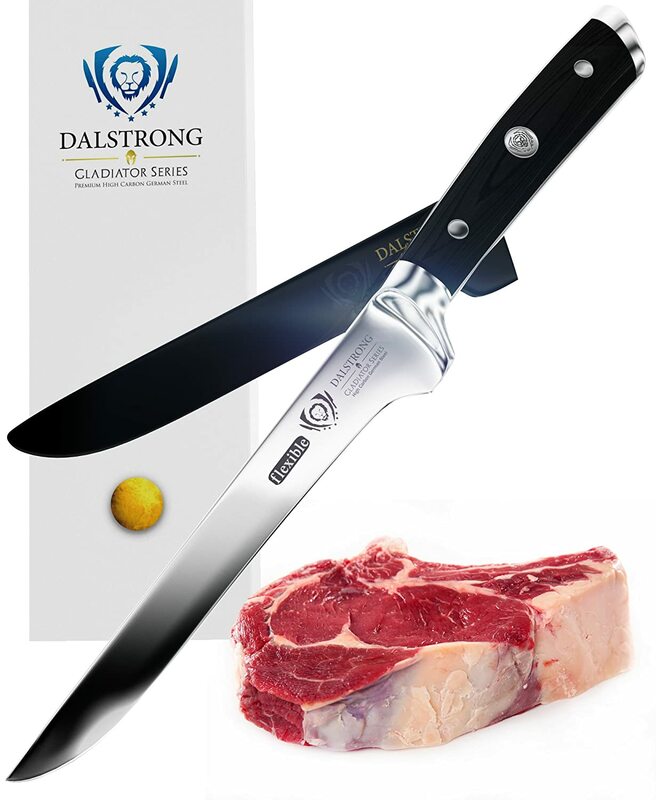 If you’re looking for a restaurant-grade boning knife, make no mistake with Dalstrong’s Boning Knife. This straight-edged knife is razor-sharp and flexible enough for de-boning, preparing, filleting, skinning, trimming and butterflying all your favorite meats. You’ll absolutely love the stunning black pakkawood handle that is triple-riveted with a grip that ensures comfort and maneuverability. The handle is also thoughtfully polished and laminated to withstand water and grease from your busy kitchen. Unlike other boning knives, this one is carefully tapered for improved hardness, flexibility, and minimal slicing resistance. We loved how the blade shape allows for easy maneuvering around bone and joints, cutting our deboning time in half. 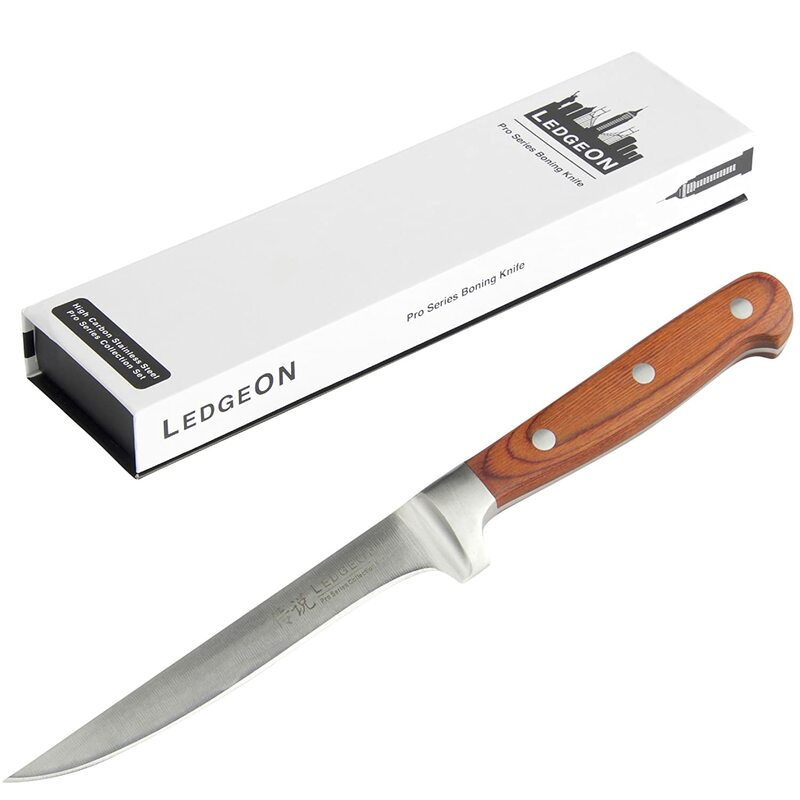 Boasting a sharp narrow blade forged from high carbon stainless steel, the LedgeOn 6” Professional Boning Knife allows precise cuttings close to bone cuts to ensure proper separation of meat and bone. The tough, corrosion-resistant blade and aesthetic pakka wood handle of this boning knife has proven its ability to withstand the rigors of tough restaurant use. A few of the things I loved about this knife is its full tang blade which creates a safer knife with a more robust, the tapered blade for thin slicing, and the tapered bolster that gives an excellent grip. I found this gem on Amazon and decided to give it a try. I fell in love instantly with this knife. It has a good solid feel to it and is sturdy in my hand. I would always buy thick boneless chicken breasts and slice them down with this baby. I haven't sharpened it yet for months now which is a plus! Don’t get us wrong, all our boning knife choices here the best of the best but the one that puts the icing on the cake is the ﻿Mercer Millennia 6” Boning Knife. Aside from its durability, right size, weight, and thickness, the greatest thing about this boning knife seemed to be its semi-stiff blades -- a hybrid between the flexible and stiff type. Having the qualities of both, the blade of this knife can debone anything – from cartilage and bones to chops and softer meat. Hey, home chef! Have you deboned any meat lately? What brand of deboning knife do you own? Do you think we missed other great stuff here in our round-up? Tell us what you think below. And hey, don’t forget to share this post. Happy cooking!